Mon(£50): 1011 – Mr R Bain, Dores Road, Inverness. Tue(£50): 2464 – Glenn Hardie, Braeside Park, Balloch, Inverness. Wed(£50): 0569 – Mr R C Wilson, Lodgehill Park, Nairn. Thu(£50): 5039 – Mr H J Mackay, Firthview Road, Inverness. Fri(£50): 0713 – Mrs J Lumsden, Torbreck Road, Inverness. Sat(£50): 4879 – Francis Budge, Grieveship Brae, Stromness, Orkney. 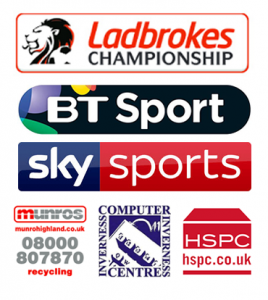 £500 WEEKLY WINNER : 0812 – David Fraser, West Mackenzie Park, Inverness. Mon(£50):0568 – Mrs Alice Murray, Sunnybank Road, Inverness. Tue(£50): 1774 – Donald Mackenzie, Ashton Road, Inverness. Wed(£50): 0129 – William MacRae, Balnabruach, Portmahomack. Thu(£50): 5261 – Mrs Evelyn Oliver, Highfield Avenue, Newport on Tay. Fri(£50): 4887 – Peter MacPhee, Towerhill Avenue, Inverness. Sat(£50): 2457 – Lorraine Gair, Millerton View, Inverness. Mon(£50): 1436 – Mrs C Mitchell, Priory Place, Beauly. Tue(£50): 0175 – Mr J L Paterson, Lomond Drive, Carnoustie. Wed(£50): 0817 – Elaine Docherty, West Heather Gardens, Inverness. Thu(£50): 1768 – Mrs Linda Campbell, Kenneth Place, Smithton, Inverness. Fri(£50): 5396 – Douglas Mentiply, Newmill, Auldearn. Sat(£50): 1159 – Michael Persichini, Home Farm Close, Farndon, Market Harborough. Mon(£50):0878 – Robert Gillanders, Balnakyle Road, Inverness. Tue(£50): 2757 – Mr Leslie Mutch, Towerhill Avenue, Inverness. Wed(£50): 5192 – Mrs Ann Gunn, Proudfoot Road, Wick. Thu(£50): 1279 – Gordon Warburton, Inshes Court, Inverness. Fri(£50): 1819 – Mrs M Jamieson, Mackintosh Road, Inverness. Sat(£50): 4364 – Mrs Kena MacWilliam, Spey Street, Kingussie. £500 WEEKLY WINNER: 1184 – Mr Chris MacInnes, Duncan Drive, Nairn. Mon(£50): 1224 – David Simpson, Dell Road, Inverness. Tue(£50): 2002 – Mr J P Donnellan, Burnbrae, Westhill, Inverness. Wed(£50): 0185 – James Birnie, Scorguie Road, Inverness. Thu(£50): 6321 – Craig MacLellan, Sycamore Crescent, Inverness. Fri(£50): 4569 – Fred Driver, Stratton, Inverness. Sat(£50): 4920 – Mrs D Wallace, Cradlehall Meadows, Inverness. £500 WEEKLY WINNER: 6261 – Mrs I L Moir, Highfield, Muir of Ord. Mon(£50): 0398 – Mrs H Watters, Creag Dhubh Terrace, Inverness. Tue(£50): 4434 – Mrs M Forrest, Edgemoor Park, Balloch, Inverness. Wed(£50): 6160 – Mrs C Campbell, Essich Road, Inverness. Thu(£50): 1998 – Mrs Ann Munro, Achinchanter, Dornoch. Fri(£50): 5449 – Alistair Macleod, Laggan Road, Inverness. Sat(£50): 2859 – Mrs K Barlow, Millerton View, Inverness. £500 WEEKLY WINNER: 2929 – Alison Worthington, Woodlands Terrace, Inverness. 2018 CENTENARY CLUB FESTIVE RAFFLE DRAW. Ticket No. 24716 – Mr E Nicolson, Burn Brae Crescent, Inverness. Ticket No. 09754 – Mr G Adamson, Lochlann Road, Inverness. Ticket No. 39229 – K MacPherson, Fairfield Road, Inverness. Ticket No. 16082 – Sean Fyffe, Sinclair Park, Smithton, Inverness. Ticket No. 11701 – Mr L McAllister, Caulfield Terrace, Inverness. Ticket No. 18651 – Brian Fraser, St Margarets Road, Inverness. Sincere thanks to all those who participated and helped make last year’s raffle draw a great success!! !